Does not your smartphone / iPhone charge via USB? Have you ever noticed that your smartphone does not charge as fast (or even at all) via the USB port of your computer? This is because the device to be charged requires more power than a standard USB port can supply. USB 3.0 ports provide standard 0.9A current (USB 2.0 ports only 0.5A), while the charge device can in practice charge a charge current of more than 1A. In the technical information of your product you can find the required charging current, is it higher than the power that your USB device can supply? Then you will be disappointed when you load your device on white via USB standard. However, Orico has the solution for you! Read more about how we can help you to charge your (mobile) equipment via USB. If you want to charge your smartphones, tablets, navigation and other devices via USB with more than 1A power then we recommend Orico USB hubs with charging function to give a higher charging current than standard. USB has been a used standard for years to connect peripherals to your PC. USB 2.0 has been the standard for years, and although USB 3.0 has been available for some time, new laptops and desktops are still limited with USB 3.0 ports. Often we see that there are only one or two USB 3.0 ports, supplemented with USB 2.0 ports. The difference in data transfer speed between USB 2.0 (480mbps) and USB 3.0 (5Gbps) was probably familiar to you, but with the developments in the field of mobile devices like smartphones, tablets, navigation systems etc and the wish to charge via USB a problem arises. Some smartphones and tablets (eg Iphone and Ipad) require more power than can be delivered via USB. This will not charge your mobile (or very slow) when it is connected to the standard 0.9A of USB 3.0. Does your device need more power than can be supplied via USB standard? 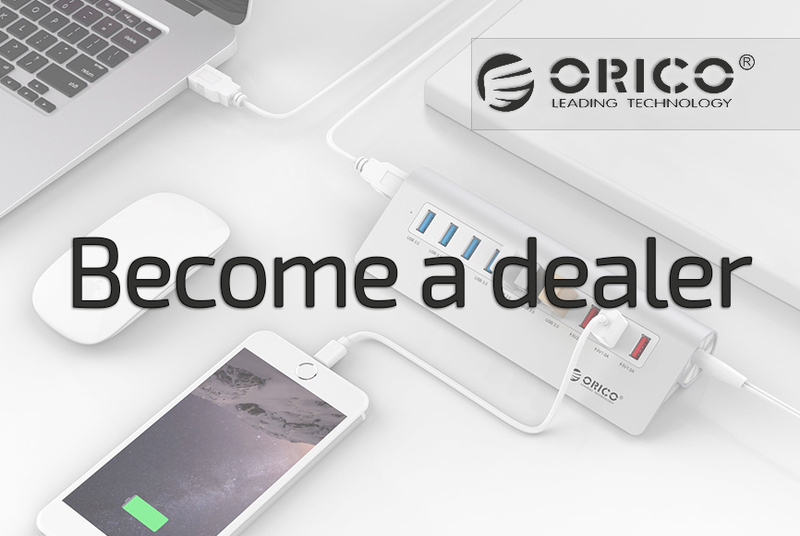 Then Orico USB hubs with special charging ports offer you the solution. With BC 1.2 the current is output 1.5A instead of the standard 0.9A of USB 3.0 when connected to a PC. If the BC1.2 is connected to mains voltage and is separate from a PC, the maximum charging current is 2.4A. Thanks to BC 1.2, you can simply recharge your mobile devices quickly! In addition, data transfer can also take place in accordance with USB 3.0. In addition to BC 1.2, hubs are also available with Smart Charge ports. These measure the charging current between 1 and 2.4A depending on the connected device. This way you always have the most optimal charging current for a fast and safe charging process. Smart Charge charging ports do not support data transfer and are only intended for charging (mobile) equipment. The latest development in the USB area is USB 3.1 (gen2) . USB 3.1 delivers 2A (5v) and offers technical possibilities up to 5A / 20V depending on the Power Delivery Profile. However, these options are only feasible with the new USB type C connection. This would also make the charging problems a thing of the past. However, be alert when you read USB 3.1 , there is confusion at the type approval and some manufacturers tempt you with USB 3.1 (gen1) which in view of the specification is equivalent to USB 3.0. We at Orico NL do not participate, and simply call USB 3.1 gen2 USB 3.1 and USB 3.1gen1 USB 3.0. More information about the different types of USB connections can be found on our USB Wikipedia . If you want to know more about charging via USB, read on on our page about ' USB charge techniques explained '. Here, among other things, the different loading techniques are explained, such as BC 1.2, Smart Charge, Quick Charge etc.